Pouliot will create a sculptural artwork on the platform situated northwest of the Gaston-Miron Building, formerly the Bibliothèque centrale de Montréal, situated on Sherbrooke Street. The chosen project is titled Dialogue and consists of a grouping of 32 pieces reproducing architectural elements composing the façade of the building on a 1:1 scale. It offers a point of convergence for the architecture of the building, the poetry of Gaston Miron – one of the great contemporary Québec poets, read and admired for the intensity and depth of his exploration of the human condition – and the artist’s approach. 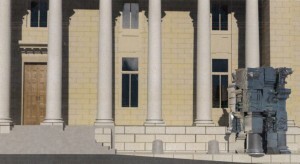 The title refers to the dialogue among these three components; the artist’s intention is to integrate a contemporary gesture with a heritage building. The installation, with a total height of 4.88 m (16 feet), will have a significant presence and function as a strong reference point for passers-by. It will both highlight the building and underline its cultural function. The Bibliothèque centrale de Montréal, designed by Montreal architect Eugène Payette (1874–1959) was under construction and ceased operations in 2005, when its collections were integrated into the Grande Bibliothèque nationale. The building underwent major renovations in 2009 and was renamed the Gaston-Miron Building. It is now home to the Conseil des arts de Montréal and the Ballets Jazz de Montréal and houses a number of rehearsal halls and an atrium that can host cultural exhibitions. This artwork, for which the acquisition plan was funded entirely by the Ville de Montréal, was selected through a competition by public notice launched for professional artists in Québec in January 2014. Eighty-four portfolios were found to be in compliance and were studied by a jury composed of visual arts professionals, users’ representatives, and key people involved with management of the Gaston-Miron Building. The two other finalists were the duo of Philippe Allard and Justin Duchesneau and Patrick Bernatchez. The total budget allocated to this public art project is $203,505.75. Pouliot’s work will be installed and inaugurated in the fall of 2016.